Arrive Paro International Airport. Your tour guide will meet you and take you on a short one-hour drive along the Paro and Thimphu river valleys to Thimphu, Bhutan’s capital, at 2320 metres. You can stop on the way to take in the magnificent Tamchhog Lhakhang, the hereditary place of worship for Bhutan’s iron bridge builder. Overnight in Thimphu. Sightseeing in Thimphu, where you can visit the National Memorial Chorten, the National Library, the National Painting School and Changangkha Temple. Browse the striking collection of intricate textiles at the National Textile Museum and visit the Folk Museum. Overnight in Thimphu. In the morning drive to Punakha via the Dochu La Pass, where we will stop for a hot drink and to enjoy views of the Eastern Himalaya ranges. In the afternoon visit Punakha Dzong, Chimi Lhakhang (Temple of Fertility), built in the 15th century by the ‘Divine Mad Man’ (Lama Drukpa Kuenley). Overnight in Punakha. Drive from Punakha to Bumthang via Trongsa, the gateway to central Bhutan. You can stop to visit the impressive TrongsaDzong which commands the eye from miles away. Visit the new museum in the watchtower dedicated to the Royal Wangchuk dynasty, which tells the stories of the Dzong and features personal belongings of the Kings and Queens of Bhutan. 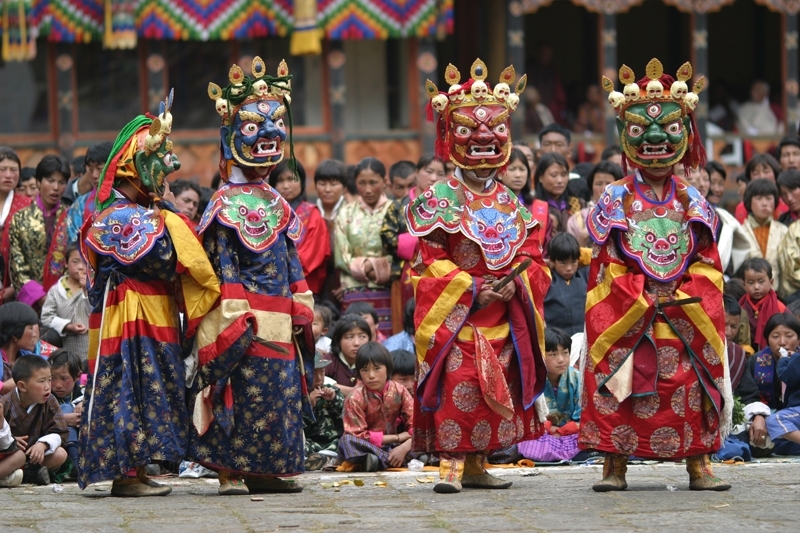 Continue your journey through some of Bhutan’s most beautiful landscapes to Bumthang. Overnight in Bumthang. A day of sightseeing in the Bumthang valleys. Your guide will take you on a fascinating tour of a variety of sacred sites including Jamba Lhakhang, Kurjey Lhakhang and Tamshing Lhakhang. Visit Jakar Dzong (Bhutan’s largest) and you may be interested to see Bumthang’s famous swiss cheese factory. Overnight in Bumthang. Today we take an excursion to the remote Tang valley. Stop to visit Membar Tsho (the burning lake), which is one of Bhutan’s most important pilgrimage sites. Then on to Drangchel, Pema Lingpa’s birthplace. You will also see some picturesque villages and temples and can walk up to visit Ugyenchholing Palace, which is now a museum and gives an interesting insight into life in an aristocratic family in the last century. Return to Bumthang for the night. Start your journey back west to Gangtey in the remote Phobjikha valley. Visit Gangtey Gompa (one of Bhutan’s oldest monasteries and recently extensively renovated) and explore the valley where the villagers continue to live a traditional Bhutanese rural lifestyle. This is the site where black-necked cranes visit in their hundreds in November each year after spending the summer in Tibet. Overnight in Gangtey. Today can be a day of leisure in this beautiful rural valley. If it is winter you can view the black-necked cranes. If you like hiking your guide will suggest a day or half day hike in the valley. Overnight in Gangtey. Return to Paro via Wangdi. Sadly Wangdi Dzong was gutted by fire in June 2012 and rebuilding will take many years. There is little now to see in Wangdi so after a brief stop continue on your way. When you reach Paro you can visit the local handicraft shops for souvenirs of your trip. Overnight in Paro. A full day of sightseeing in and around Paro including Paro Rinpung Dzong and the National Museum. After lunch visit Drukgyel Dzong (‘fortress of victory’), and the sacred Kyichu Lhakhang (temple). Overnight in Paro. Take a day hike to the ‘Tiger’s Nest’, the sacred Taktshang monastery, and have lunch at the Taktshang cafeteria. On the way back you can visit Dumtse Lhakhang, a temple built by Thangthong Gyalpo, the iron bridge builder. Overnight in Paro. Depart from Paro International Airport.